Double row accordions typically have eight buttons on the left or bass side, arranged in two vertical rows, yielding six bass notes and six chords. The most basic reason for learning to play bass notes and chords is to enhance or augment the melodic rhythm. 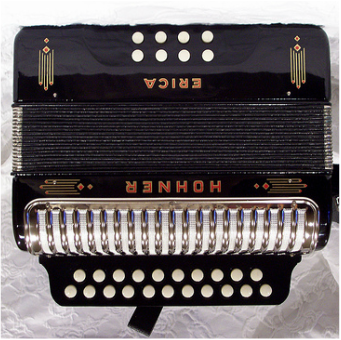 Many button accordion players play only the treble, or right, side, and have no interest in the left side, except for the air button. I have been playing the treble section of my accordion for many years, off and on (mostly off). I have to admit that I began to play the left-side bass and chords only recently. As you hold the accordion to play, the treble buttons, providing the melody, are on your right, and the bass and chord buttons, which can enhance the rhythm and contribute to the tune's harmonic content, are on your left. The treble buttons are usually numbered from 1 to 11 (outside row) and from 1 to 10 (inside row), where 1 is the button nearest the chin. Buttons o1 and o2 are normally matched to the right-hand outside treble row. Buttons o3 and o4 are normally matched to the right-hand inside treble row. 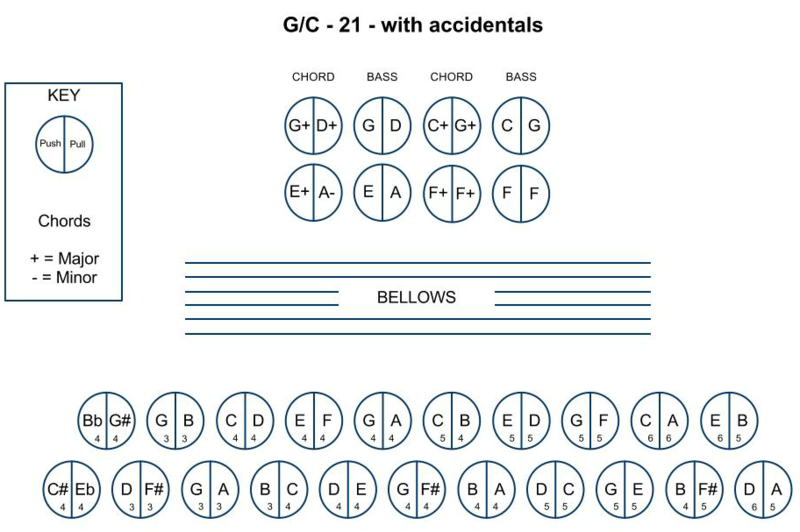 The layout for the very common (at least, in Newfoundland and Labrador) G-C and A-D accordions are shown below. The numbers with the treble notes are referenced to the piano (C4 corresponds to the piano's middle C, for example). These diagrams were created by Lester Bailey, and copied from an excellent UK melodeon site (their name for our button accordions). If interested, CLICK HERE to check out their button-layout drawings for other accordions. It will open in a separate window, so you can easily move back and forth between sites. If you are playing the left-side mostly for rhythmic beat, then you can play Left (outer) button o1 (& o1*) for the chords, and Left (outer) button o2 (& o2*) for the bass. If you are playing the left-side mostly for rhythmic beat, then you can play Left (outer) button o3 (& o3*) for the chords, and Left (outer) button o4 (& o4*) for the bass. 2/2 (or 2/4) use the pattern | Bass-Chord | for each bar of the tune. 3/4 use the pattern | Bass-Chord-Chord | for each bar. 4/4, try the patterns | Bass-Chord-Chord-Chord | and | Bass-Chord-Bass-Chord | for each bar, and use the one that sounds best or feels right for the tune you are playing. 6. Finding and Playing Accidentals. Consider the G-C keyed accordion diagram above. Buttons 2 to 10 of the inside row contain the notes of the C diatonic collection (C, D, E, F, G, A and B), repeated to cover more than two octaves. Sometimes a tune written for the key of C, will contain a note or two, here and there, that is not in the C collection (such as C#, D#, F#, G# and A#). Such notes are called accidentals. Similarly Buttons 2 to 11 of the outside row contain the notes of the G diatonic collection (G, A, B, C, D, E and F#). Sometimes a tune, written for the key of G, will contain a note or two, here and there, that is not in the G collection (such as G#, A#, C#, D# and F), and these notes are also called accidentals. Button 1 of the inside row of the G-C accordion contains the mid-range (octave 4 range on piano) notes A# (on the push) and G# (on the pull). Button 1 of the outside row contains the mid-range notes C# (on the push) and D# on the pull. If you are playing on the inside row you can obtain an accidental F# from the outside row, and if you are playing on the outside row you can obtain an accidental F from the inside row. This allows you to correctly play many tunes with accidentals, though not all, since some may be pitched lower or higher than the mid-range. 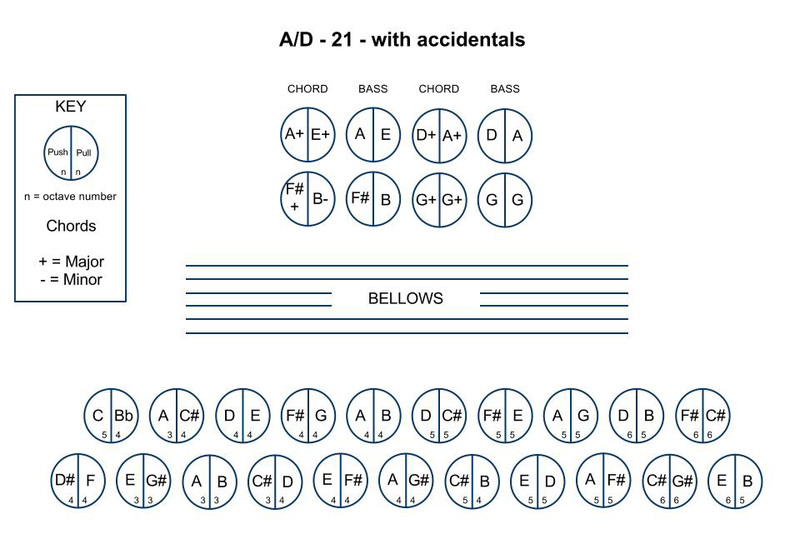 As you can see from an examination of the A-D keyed accordion diagram above, each key has its own set of possible accidentals. The tunes on this site include these button numbers, with a row indicator (o1, o1*, i1, i1*, for example) if different from the row on which you are mainly playing. That way, you don't have to remember the note names and locations of these accidentals for all of the various keys.